Every now and then, serendipity intervenes in my life. One of the days she was working overtime was the day I met Gordon Bonnet. 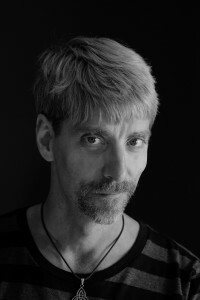 Gordon and I are both published by Oghma Creative Media. At the time I met him, I was the marketing director there, and I met him to discuss media kits, promotional materials, etc. I didn’t often have time to read every word of every manuscript of every writer we represented, but in Gordon’s case, I made the time. 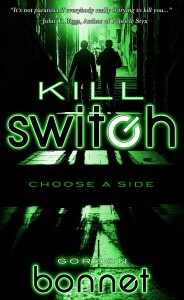 His novel, Kill Switch, grabbed me by the throat. I couldn’t put it down. It was fabulous. Then I learned more about the guy. He not only wrote well, he wrote fast, and he offered Oghma several more manuscripts (which I’m so glad they snatched up). He has a fantastic skeptics blog, Skeptophilia. And not only was he hard-working, he was a joy to work with. I was talking to my younger son about quantum physics, as one does, and the subject of the “Many Worlds interpretation” came up. This is the idea that every time an event could have gone one of two different ways, it goes both—in different universes. Put another way, when there’s a decision to be made, every possible outcome occurs somewhere. And that was the birth of the Library of Timelines, the setting for my recently-released novel Lock & Key. In the opening pages, we meet Darren Ault, a mild-mannered Seattle bookstore owner, who is invited over to his friend Lee’s apartment for dinner. After the meal is over, though, Lee pulls out a pistol and shoots Darren in the head. Far from killing him, the gunshot makes the rest of humanity—Lee included—vanish. Somehow, Darren’s death has caused a temporal paradox, and the event has left only one person alive. Well, not just Darren. Also the staff of the Library of Timelines, including the Head Librarian, Archibald Fischer, and Fischer’s right-hand, his administrative assistant Maggie Carmichael. After some inquiry, they decide to send Darren into the past to try to figure out what has happened and to attempt to repair the damage. This starts Darren on a journey careening through time and history, first to 11th century Scotland, followed by 14th century Norway and 19th century Kentucky, each time to a place and time the Master Computer of the Library has identified as a pivot point for the paradox. Along the way, he meets Vikings, a perennially-depressed Norwegian silversmith, an insane highwayman, a religious cult that believes the way to salvation is through pain, a beautiful red-haired Hebridean lass, a brilliant but unstable physicist, and an elderly peasant woman who couples smart advice with a talent for throwing dumplings at people she doesn’t like. Darren is assured that on his travels, the Master Computer is looking out for him, and will make sure he is brought back to the Library if his life is in peril. It’s flawless, Fischer says. Darren will be fine, there’s nothing to worry about. “And the computer always gets you out just in time?” Darren said. “Well, there was Janowsky,” Maggie said. “Morbid type, if you ask me.” Maggie’s round face radiated disapproval. “Took forever to get the stain out of the carpet,” Fischer said. And with that reassurance, Darren is launched on the adventure of his life. 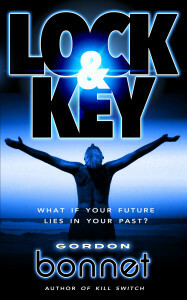 Lock & Key weaves together time travel with humor, history, and the question that all of us have considered from time to time—what would have happened had we chosen differently? Just remember, next time you are faced with choices, the decision is yours to make. But everything is being monitored by Fischer and his computer. If you ever get a chance to visit the Library of Timelines, ask Fischer and Maggie if you can check on the Computer and see what would have happened had you made a different choice. You never know. They might just let you. Are you as intrigued as I am? How can you not be? I haven’t read this one yet, but it’s definitely on my list. If you have any questions or comments for Gordon, please leave them below. Always love to meet new authors and learn about their journeys. Thank you! I’m glad you dropped by. Gordon Bonnet is one you won’t want to miss. Thanks for sharing, Staci. You have opened me up to books that I may have passed by. There are so many books and authors out there, Michele. We can’t possibly know all of them. I’m just happy to share the treasures I find with others. What an intriguing concept for a novel. I checked out Kill Switch too, and am going to add both of these to my TBR. Definitely my kind of reading. Thanks for showcasing Gordon’s novels, Staci. And, Gordon, wishing you the best for many sales! I think you’ll really enjoy his work, Mae. He’s quite talented, and the concepts of his novels are fantastic.